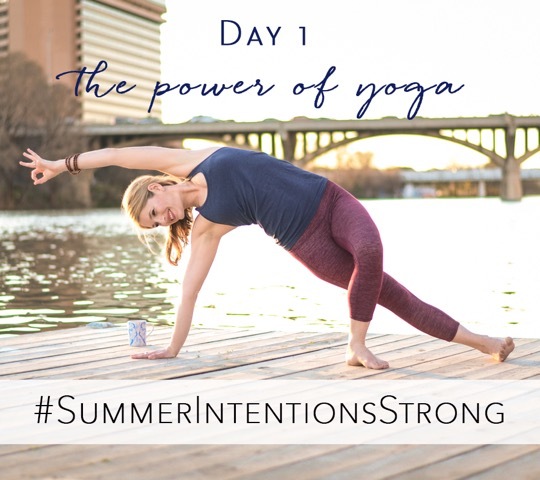 Join the full #SummerIntentionsStrong challenge on instagram! 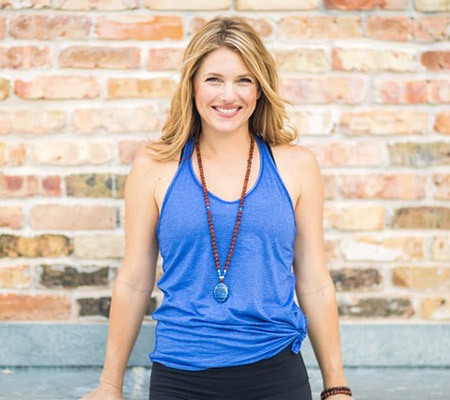 Participate everyday this week (June 20-24) and you’ll be entered to win an amazing gift pack that includes my Pillars of Power Yoga course with YogaJournal.com. Here’s my post from this morning. Please join me on instagram and share your summer intentions! I used to work in the high-paced world of political campaigns. I felt like I had to be fully immersed at all times and I let my work life consume the rest of my life. With my focus on my career, I was spending so much time in my head and created a disconnect with my body. With pain and numbness throughout half my body, a trip to the emergency room became my wake-up call. This humbling experience was my call to live with more power and purpose, and it brought me to my yoga mat. My yoga practice served as my vehicle to rebuild strength, sensation and connection as I re-awakened my body. My yoga practice has taught me how to tune in – how to listen to the divine intelligence coming from within my body. From my practice I’ve learned that my true power comes from listening to my body, not in doing things the way I think they should be done or the way I’ve done it before. For example right now, I’m learning from my practice that my body is calling me to slow down and be gentle. Tell me about your practice— What have you learned from your commitment on your mat? And what’s one thing you want to focus on this summer? Maybe you want to hit handstand, sign-up for a teacher training, or start your home practice. It can be anything! As you declare your intention, you set your plan into motion. As the heat turns up this summer, it’s my intention to honor my body’s call for more grace and ease. With my packed schedule this summer, my intention is for my practice to be my place to unwind and relax, rather than push and achieve. Right now I’m being drawn to a slower movements, longer holds, adaptations and gentle variations. It doesn’t have to be a crazy big goal, just listen to your body, and share with us on instagram using the hashtag #SummerIntentionsStrong. Leah, I’m so thrilled to have a summer connection to you. Your quiet strength carried me through level one in February more than you’ll ever know. You were a role model of respect and strength that I hope to emulate. This summer I’m committed to moving around, trying other studios, other teachers and spaces to expand my practice. The more I think about this the more excited I’m getting, thanks for the push!